I have been mentioned in the New York Times, in an article entitled, “Credit Card Companies Go to War Against Losses,” by Ron Lieber, who contacted me earlier this week. Frankly, squeezing customers too hard and “going to war” against consumers (as Chase Card Services has done with hundreds of thousands of customers who were promised low “fixed APR Until the balance is paid in full loans“), does not seem like an idea that’s all that “swift,” ever, but especially at this particular time with the economy already in shambles. Let’s leave the $25 billion dollars in bail out money that Chase has received (which it won’t account for), and its spending spree buying other banking assets like Washington Mutual on the table for a moment, and just talk strategy in terms of building brands (that help protect any company against losses, regardless of its line of business). Doing the right thing by people, whether we’re talking about a small company, or a monster-sized organization like Chase, such that customers are inclined to be loyal and give you their continuing business over a long period of time, is the only effective way to protect against losses. No need to be an economist or some other kind of guru, all it takes is common sense to realize that when you destroy customer relationships, people quit doing business with you, and then you really have losses. Nope, this is the stuff of Aesop’s fables, what you learned in a sand-box as a kid. It’s not a minor point, rather, it is a major point that the individuals who received this change in terms notice have been faithfully paying on time and honoring their commitments with respect to the group of accounts that have been impacted. Indeed, I’ve got a boat-load of other things to say about “only paying the minimum” and “changes affected less than one half of 1 percent of its accounts and were aimed at those who had carried large balances for more than two years while making little progress in paying them off,” in other posts, because unlike Mr. Lieber, I do have plenty of space here. So, infuriating good customers is by no stretch of the imagination a way to engender loyalty (duh!). To be blunt, it does not really seem all that smart. Actually, that was still not as direct as I need to be: it is absolutely, completely insane, or imbecilic, or both (I do, however, wish sometimes that I could fly around in a corporate jet, and get multi-million dollar bonuses, for being that stupid). 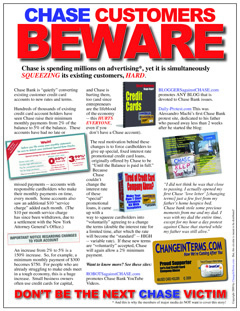 And, recently, Chase Card Services has been acting like the biggest, baddest, meanest, most ornery, despicable, evil, barbaric, sleazy, loathsome, lying, thieving, underhanded, scheming, coercive, bully in the lives of hundreds of thousands of account holders, upon whom it has indeed — no argument with that part — declared full-blown, knock-down-drag-out, eyeball-gouging, hit-them-with-a-shovel, hair-pulling, no-holds-barred, take-no-prisoners, wipe-good-account-holders-from-the-face-of-the-scorched-earth, put-a-cherry-bomb-in-their-mouths, pour-gasoline-on-them-and-light-it, then “nuke ’em,” war. Excuse me! Sound financial management (of your $25 billion dollars in bail out money, dear reader-taxpayer) relative to any bank’s prevention of further losses would dictate that it keep the “good accounts,” and try to shed the “bad accounts.” In the lending business, good accounts are defined as those that are associated with people who are paying their bills, and bad accounts are defined as those that are associated with people who do not. Hence, based on its mismanagement and bungling, and lack of leadership (I won’t go into ethics here: I’m just talking about basic managerial competence; albeit, that would include ethics), it will be a long, long time, before Chase will be in any kind of position to pay you (and me) back. So don’t hold your breath, unless you are waiting to see Chase back on Capital Hill, begging for some more of your taxpayer money (and mine), because its executives somehow don’t get it, when it comes to loyalty and managing their own brand. What a total joke, that Chase is still promoting its “Freedom Card,” while is at the same time trashing people who have one, and who have been using it responsibly. Who is the real enemy, here? In their zeal to supposedly protect themselves against losses, is it a good strategy to alienate people who have paid on time, and faithfully? While Chase’s actions are indeed consistent with waging war on consumers, is it protecting itself against losses, really? Posted in: "Bail Out", Class Action, Credit Cards Coverage in the Media, Dirty Tricks and Traps, Join the Fight. ← This is great, BREAKING NEWS! Go KGO-TV San Francisco, CA, news team! The discussion was intended to be “a play on words” with the title of the NY Times piece. I can’t please everybody with everything I write. Sorry. Hate to say it Dr. Lahm, but this post seems to be a lot of silly ranting. War? Not really. However, to be concise, Chase is tightening the credit noose on the wrong people. I think the reason Chase is doing this is they are trying to prop up the asset-backed securities that funded these balance transfers. Now the bond will post significant prepayments (something Wall Street typically doesn’t like), shrink in outstanding balance, but also pay more interest on the remaining balance to the support tranch investors. In the end, Chase will have better valuation of these toxic assets on its balance sheet. None of this, however, condones the unfair credit practices they are using to achieve this end, and I do believe the courts and administration will severely chastise them for going too far.